Coming soon to California schools near you: larger classes, fewer courses, and an end to sports and arts programs. All of this and much worse could come to pass after Nov. 6 if voters approve Prop. 32, a deceptive and outrageous initiative which would empower corporations, Super PACs and the wealthy to control California. That would spell disaster for public education and the state as a whole. Prop. 32, the Special Exemptions Act, would sharply limit unions’ ability to raise money from their members and completely prohibit them from contributing to candidates. Prop. 32’s supporters claim the measure is “paycheck protection” but nurses, firefighters and teachers like myself don’t need or want protection from our own unions. And anyone who approves of an eight-hour workday, minimum wage, weekends and overtime benefits from healthy unions, whether they are members or not. Our state’s voters rejected this idea twice before, leading Prop. 32 supporters to try a new trick. This union-busting measure contains language about corporate paycheck deductions, giving the proposal the appearance of fairness. But since businesses and their owners can simply raise limitless political contributions through profits, Prop. 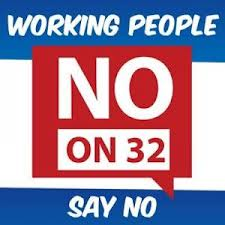 32 will leave corporate power unchecked while crippling unions that currently balance their influence. In addition, the measure does nothing to check unlimited political spending of Super PACs, the new political action committees unleashed by the Supreme Court’s ruling in the Citizens United case. Through Super PACs, anonymous wealthy donors are already spending hundreds of millions to influence the 2012 elections nationwide. Should Prop. 32 pass, what parts of their agenda will they impose here? Other states are fighting voter suppression, mandatory vaginal ultrasounds for women seeking abortions and vouchers to siphon support from cash-strapped public schools. If unions become powerless, perhaps a better question is, what parts of the extremists’ agenda won’t they impose here? We know what corporate rule would be like because California once had it, as a summer visit to the mining town of Bodie reminded me. There the Standard Mill, built in 1877, once pulverized a ton of ore to extract each ounce of gold from mines. This destructive process laid waste to entire mountainsides but more shocking was the plant’s harm to its own employees. Rock-crushing machines deafened workers, mercury exposure poisoned them and factory equipment maimed and killed many, all without compensation. The mill is full of hazards that the law would never permit today. Governor Hiram Johnson brought California the initiative a century ago to break the stranglehold big business held on the state’s government and people. To see his direct democracy used to empower corporations and the super-wealthy while silencing working people would surely make the progressive leader spin in his grave. Prop. 32 would send us on a calamitous journey back to a dark period in our history. Democrats, Republicans and independents alike should know better.